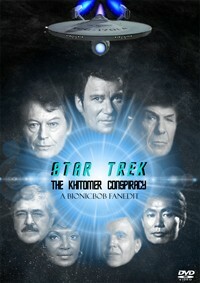 Intention: Bring this movie more in line with the Trek Franchise Timeline. 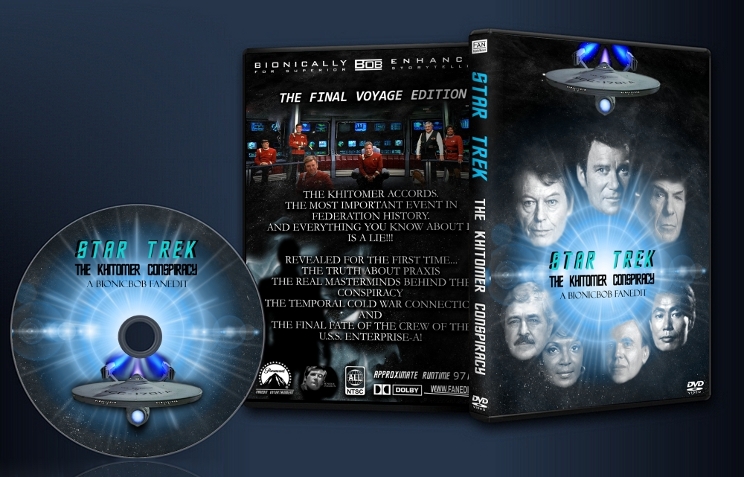 I've watched all of Bionic Bob's TOS Star Trek edits now, in order, and more or less in a marathon! Every single one of them, for me, was probably better than the original. This one was no exception. Star Trek VI is one of those Trek movies I can't get enough of, Shakesperian Klingons, the Kirk vs Shape-Shifter Kirk fight, Spock playing Sherlock Holmes and solving a rather ellaborate mystery...as I've aged, I find coming back to it a more enriching experiance than the last. Bob's edit, I'm glad to say, not only heightens the experiance further, but completly reinvents the wheel. Playing out like a tv episode, and not just relying on seemless transistions to evoke the feel of watching one, but also incorporating elements from the Star Trek tv series canon, rewriting visual and narrative histories with reletive ease. By viewing this edit, you discover a whole new country. The only negative I have to give it is the write-up at the end talking about the fates of the crew...it feels too tacked on and has a whiff of fanfilm to it, I don't have a problem with that sort of thing, but it's such a stark difference from the professional job and visual quality that preceeded it. A worthy finish to BionicBob’s Trek edits. I wasn’t a fan of Undiscovered Country and the changes here worked quite well. Great edit. But for basically two things, this would be my go-too version of the film. My only issues are basically differences of taste. You said from the outset that you wanted this to be a kitchen-sink fanboy edit, and it's those choices that bugged me. Future Guy was actually pretty well integrated, and while I wouldn't personally have put him in, I totally get what you're going for. The changeling, on the other hand, I didn't think was well executed and I'd like to see a copy of this edit with that sliced out. Plus, if I'm to believe that the Dominion was behind the entire plot, shouldn't I see changelings at the very beginning, when Praxis is bombed? I also would have liked to see, in the postscript, a little more of an explanation on the role played by the Enterprise crew in the temporal war, what Future Guy was trying to accomplish by getting involved with this whole thing, why the Dominion's plans and Future Guy's plans dovetailed so nicely, and whether or not--as hinted--Nero, the destruction of Romulus, and the alternate timeline movies have anything to do with all of this. Another great edit from Bionic Bob. This one is even better than his Star Trek: Nemesis edit, which is saying something. He has taken elements from the ENTERPRISE era Temporal Cold War and used them as a frame story, giving Khitomer conspiracy a slightly different feel. The choices that he made were all great. The editing is spot on. The new storyline is much improved, and the edit is a lot of fun. It's got some good old fanboying in it, too. That's nice. My only complaint, and it's a minor one, is that the audio during Spock and Kirk's showdown has a few noticeable cuts. I don't know if it would be an issue with speakers, but listening through headphones I certainly noticed that cuts had been made. As i said, this was a minor issue. Bionic Bob has a tendency to step beyond cut and paste jobs, and introduce new story elements into his edits. This one continues that tradition to great effect. The DVD presentation was also very well done. I loved the menus, and the bonus features (making of and two trailers) were a nice touch. All in all, another fantastic edit.